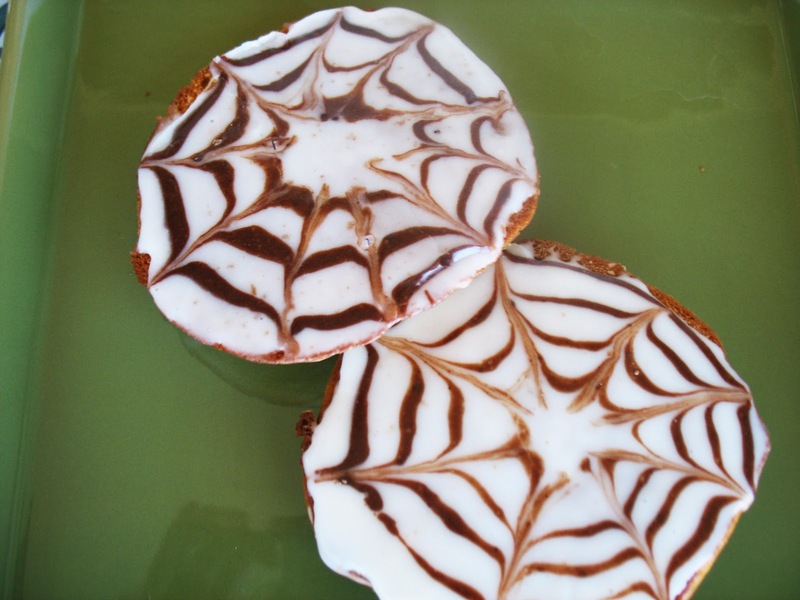 These spiderweb cookies are so yummy. I found the recipe in Family Circle. The cookie recipe is a really moist and cake like type pumpkin cookie, and the icing is just the right amount of sweetness. Mmmm. Anybody can do these, no special equipment needed. And, and the great part is that if you just want spiderweb cookies you can use a store bought cookie and make the icing. Preheat the oven to 350°. Coat 2 baking sheets with nonstick cooking spray. In bowl, combine flour, baking soda, salt and allspice. In small bowl, stir together the pumpkin and milk. In large bowl, beat sugar and butter until blended, 1 minute. Beat in eggs. On low speed, alternately beat in flour mixture and pumpkin mixture, ending with flour mixture. 2. Drop 1/4-cupfuls of dough onto prepared sheets, spacing 2 inches apart. Spread slightly with spatula. They will not spread much during baking so try to make them pretty flat. 3. Bake 1 sheet at a time , until toothpick inserted in centers tests clean. It took 11 minutes for me. Remove cookies to rack to cool. Blend confectioners sugar, corn syrup, vanilla and 3 tablespoons plus 2 teaspoons milk until smooth. Remove 1/3 cup icing to small bowl and stir in cocoa and remaining 2 teaspoons milk. Make sure you get all the clumps of cocoa broken up. Transfer chocolate icing to plastic bag; snip off corner. 5. Turn cookies flat-side up (bottom of the cooking facing up). Spread white icing over one cookie. Beginning in center, pipe a spiral of chocolate icing onto cookie. Starting in center of spiral, drag a knife through spiral for spiderweb pattern. Repeat with all cookies. Let stand until set. If you get to a spot where your chocolate won't squeeze out easily then you probably have a little cocoa clump. Just squeeze it out onto a plate or whatever by pinching with your fingers. Just love your spider web cookies they are so cute. The recipe looks really good. I recently learned how to do the spider-web pattern too. Your cookies look fantastic and I like the fact that they're pumpkin. This is fun indeed! I bet the treat or trickers will love it! cute and i bet yummy! i'd love to make this. thanks for sharing the recipe. Impressive, great for Halloween! happy weekend! Very cool--I'm going to see if my teen daughters want to try making these! Thanks for explaining the spider web part (and the potential cocoa-clump glitches); and thanks, too, for linking to Food on Fridays! Hi! I'm Katie. I love to eat, and I love to cook. I'm trying to learn more about healthy eating and using ingredients that will help us be our best. Coasters Tutorial- Simple but Sophisticated for only $1.65!